We’re excited to announce a new partnership with Engaged Public from Colorado, USA. Engaged Public is a public policy consulting firm founded in 1998 and specializing in engagement-driven strategies and public policy leadership development. Since 2007 Engaged Public have been developing a participatory budgeting tool that is nowadays known by the name of Balancing Act. 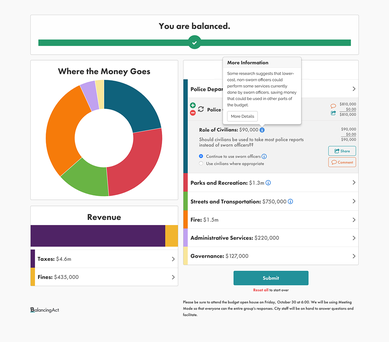 The core of Balancing Act is a budget simulator that allows to visualise a budget including incomes and expenses in an easy and understandable way. The tool also allows the users to try different simulations of the budget and even compare different alternatives. Balancing Act makes it clear and visual what it means in relation to other budget items if one allocated more money into a particular category. Balancing Act has a huge user base of local and state governments. “We’re excited to bring the leading and most advanced participatory budget tool on to the Australian market”, says Kristian Jaakkola, managing director of ArneTech. “We’re happy to have found a leading community engagement solutions provider in Australia to represent our product in Australasia and looking forward to providing our software to new clients and markets with ArneTech”, replies Brenda Morrison, Partner of Engaged Public. Balancing Act is as of now available from ArneTech for clients in Australia and New Zealand. We will provide you with local support, training and help. If you would like learn more or to book a demo, contact us. You might also be interested to attend one of our participatory budgeting events around Australia.